Hawke’s Bay Civil Operations Manager Pearl Jury became the first woman to gain her Civil Trades certification, the nationally recognised accreditation programme for civil contractors in New Zealand. 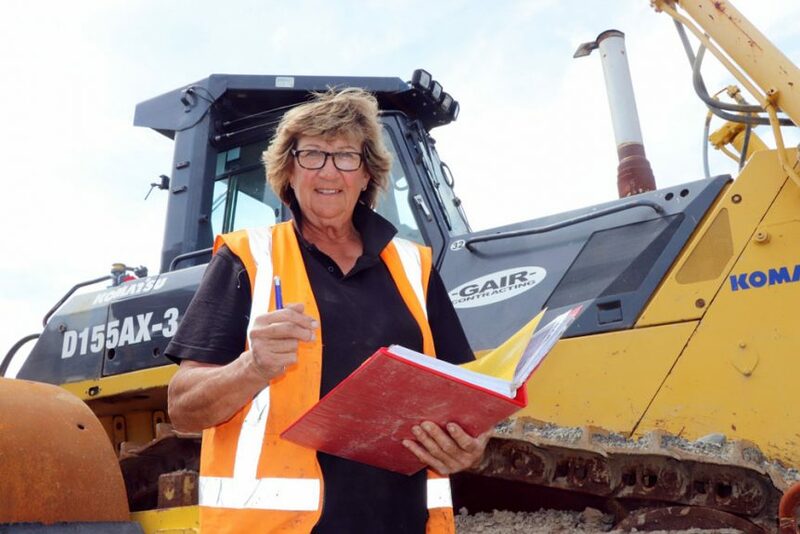 Pearl has more than 15 years’ experience with Gair Contracting in Napier, she loves working with heavy machinery, and the company is one of the few contracting companies in New Zealand led by a woman – Director Bailey Gair. A string of other retail jobs followed before she switched to an apprenticeship with a joinery company and discovered a love of machines and hands-on work. But it was a short-term thing because Pearl and her husband Chris soon abandoned townie life for what would become 27 years of farming in the back blocks of Hawke’s Bay. When they returned to town, Chris got a job grader driving with Gair Contracting. “I just happened to go in with him one day, and got on the digger, as you do, and started working. Two weeks later they rung up and asked if I would be interested in coming to work with them for a couple of weeks, that went by and I kept asking ‘so do I come back?’ And that’s how it all started really,” Pearl says. What’s kept her there is a mix of incredible support from the business which has seen her grow from a machinery operator to Civil Operations Manager, but also, simply a love of the work. Despite her project management responsibilities Pearl can still be found driving a digger most days. “I still just really love it.” And now she particularly loves passing on her knowledge and experience to the newcomers who start with the business,” she says. It hasn’t always been smooth sailing for Pearl having her skills recognised as one of the very few women in the hands-on side of the civil construction sector. “Yeah there were times in the early days where you’d meet people who were used to things being a certain way. But I always gave as good as I got and in the end we all just got on with the job. And now, of Pearl’s two sons and one daughter, it’s her daughter that has followed in her footsteps and is also working in the civil contracting sector working with the heavy machines.